In stock - low quantity. Order in the next 3 hours, 20 minutes and it will go out today! John Taylor is acclaimed as one of Australia's foremost performers and creators of magic and illusion and has performed to more international audiences then any other Magician in Australia. John's signature inventors piece would have to be the 21st century Metamorphosis called "Suspended Animation" which hit international fame when it was released to the magic community in the year 2000 and Ultimate Dimension, in which John Taylor released in 2014. Now for the first time, John is going to share with you an original effect of his, which has been kept secret for over 25 years and he is proud to release to the magic community! Effect: The performer brings a spectator on stage and uses them for a magic trick. As a gift for assisting the magician he makes them a balloon dog. Just before they go back to their seat they are asked what the time is. The spectator looks at their wrist to see their watch gone and the performer comments, "If only we had a watch dog." 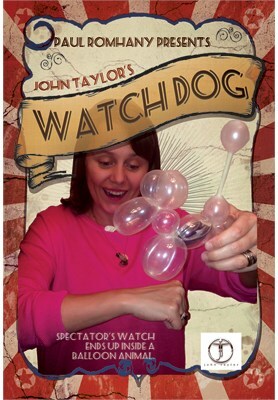 Upon looking at the balloon dog the volunteer discovers THEIR watch inside the dog's tummy. Included in the book is are some video links where John shows you his technique to steal a watch which is made EASY by the structure of this routine. If you can make a balloon animal then you can perform Johns' routine. John also explains how to perform this in a close-up situation - so it is an ideal routine for walk-about, restaurants, stand-up and stage. If you want to create a seemingly impossible miracle for your audience that hits them right between the eyes... then this is it!